Cross-posted from the Particls blog. 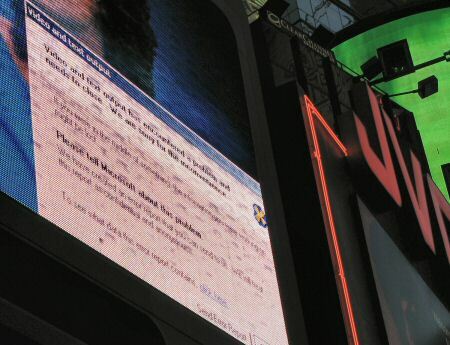 See, Touchstone Alpha is not the only product that crashes 😉 Checkout this photo of a giant electronic billboard in Times Square, New York City. Link. Over the Christmas break, the Touchstone development team has taken some personal time out to remind their families that they are still alive. Since this naturally has slowed the pace of development, it has taken some of the pressures away from me as a director and founder to take 5 minutes to reflect on the past year and realise the massive steps we’ve taken both professionally and personally. After this reflection, I have realised how lucky I am to have a partner and friend like Chris. I know there are many other ‘dual founders’ out there, but I’m sure none of them have quite the same relationship as Chris and I. We’re both burdened with an over-abundance of passion and opinion, and while this has on occasion raised some eyebrows in the office, we never let ego get in the way of decisions and we’re very careful to support each other when it’s needed. Plus, there isn’t anything quite so depressing when you’ve fallen in love with an idea or aspect of the business, and your co-founder tells you that it can’t “be that way” – and you knowing in your heart that he’s right. But when he doesn’t hold this against you, you realise how lucky you really are. Chris, you are an intelligent and co-operative friend and colleague and I want to take this opportunity to publicly thank you for your effort, tenacity, patience and inspiration which helps push me past what I previously thought impossible.